What a way to describe one of the most frustrating professional sports lockouts. BREAKING NEWS: there is a tentative deal in place. Repeat – there is a tentative deal in place. The NBA owners and players agreed on a tentative deal earlier this morning that would allow the NBA season to start on Christmas day and end this 149-day lockout. A majority of each side now needs to approve this deal which mean 15 of 29 teams (excluding the New Orleans Hornets who are owned by the league) and a majority of the 430-plus members from the union. The union, however, just recently disbanded and became a trade association, so they could file an antitrust lawsuit against the owners. They will need to drop this lawsuit and become a union once again to vote on the deal. Regardless of whether this deal is accepted or rejected, I will have a follow-up post later today. The fact that they are on the doorstep of unlocking this NBA season brings me to believe both sides will have a hard time turning this down. However, you must be wary with these two sides as many possible deals for an NBA season have come and gone. We all just have to hope that this one is legitimate. I guess we’ll know soon enough. Remember that association that was thriving earlier this year? I keep forgetting about it. The owners put an offer on the table for the players. It consisted of a 50-50 split of the BRI and a possible 72-game season starting December 15. It was there for their taking. Unfortunately, the players (or the agents… or Billy Hunter… it’s hard to really know) were unhappy with other restrictions the owners placed on big-spending teams, hindering their ability to sign free agents, so they said forget it. Now that this deal has been rejected, there are some consequences that will take place in the upcoming days or weeks. The NBPA (National Basketball Players Association) is planning to file an antitrust lawsuit against the league. However, they will need a solid case because the league has already filed a pre-emptive lawsuit that would prove the current lockout to be lawful. Furthermore, in this lawsuit, the owners made the case to void all players’ guaranteed contracts. If bargaining is somehow able to continue, David Stern has made it clear the next offer would be a 53-47 percent split of the BRI, with the players receiving the lower amount. He also suggested possible rollbacks for any current salaries. It is ridiculous for players to receive less revenue than the owners in a league where players can completely transform a team by simply putting on that team’s jersey. I don’t care how personal the lockout is or how bad the previous deal was, no fan has bought or is going to buy season tickets to Heat games to see Pat Riley sit on the sideline. They want to see their team’s players on the court. The players deserve at least half of the revenue, and if 47% is the next offer, even I, who wants basketball as badly as anyone, would side with the players to reject the offer. I know I sound like a broken record and am probably repeating a lot of the things I said from one of my posts in October, but I can’t help but be baffled about one aspect of this lockout: the lack of a plan. The National Basketball Association knew this lockout was coming. No question. As each lockout day goes by, I begin to have less and less hope for an NBA season because the owners and players can’t seem to come to any sort of understanding. But shouldn’t these two sides have already put together a plan to attack this inevitable dispute? Why does each side sound so surprised about the stance the other group is taking? By the time answers to these questions are figured out, it might be too late. There have been moments during these disappointing times when blaming David Stern or the players or the agents or whatever side you believe is doing the most damage is the natural thing to do. However, we are now at the point where both sides have been given the opportunity to compromise and lead this league to the key that will finally unlock the door to an NBA season. Unfortunately, every time, a middle ground has been out of the question for either group. The fact that an absence of NBA basketball for 2011-2012 is becoming more and more apparent has to be put on the shoulders of both the owners and the players. Billy and David can continue to point at each other, but that won’t make the lockout move anywhere closer to a resolution. This whole thing is really hard to swallow. Sadly, it looks like we need to get ready for the (as David Stern said) “nuclear winter. David Stern is willing to give up as much of the NBA season as possible to "win" this lockout. Are you okay with that? Well, going against my most recent NBA lockout article, things are back to not looking good. What’s frustrating more than anything is how these two sides can have multiple long, successful meetings in a row and then have a single meeting destroy all growing optimism. At the 2:04 mark, Stern mentions that executive director Billy Hunter had been “receiving calls from agents” regarding the revenue splits. I don’t understand why I keep hearing quotes regarding the agents’ influence on the lockout. Who is in charge of the players’ side of the negotiation? The players or their agents? There is a question asked at the 3:38 mark pertaining to the fact that the owners would be getting two-thirds of their losses back if they accepted a 52-48 split. David Stern decides to explain how the owners and players “talked about revenue sharing” and speaks around the question instead of simply answering it. There is nothing more frustrating in conferences like these than when questions will not be answered directly. At the 5:50 mark, David Stern lets out a sigh and says “I don’t know” when asked if the two sides are at their bottom lines negotiating. I don’t know if this is frustration, depression, or helplessness, but he just seems out of energy to go on with any sort of discussion at this point. There was not a single time during that 6:29 conference when Stern came close to mentioning that he is hoping or striving for a 2011-2012 NBA season. During the NFL lockout, NFL commissioner Roger Goodell was publicly insistent on making a deal happen so America could have football once again. If Stern really wants to have his two extra percentage points so there can be a 50-50 split, so be it…. 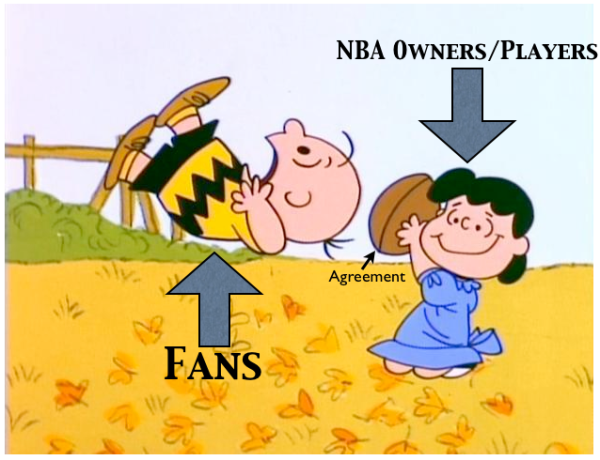 There has been little reason to be optimistic throughout this NBA Lockout. Even though many will continue to take this stance, I honestly have changed my ways and become an optimist. The NBA players and owners got together for a meeting on Wednesday and ended up talking for more than 15 hours, going past 3 a.m. ET. They will return to the table at 2 p.m. today to continue discussions. As they are obviously told to do so until there is an official agreement, Derek Fisher and David Stern were ambiguous with their answers and would not provide any specifics about the meeting. The first two weeks of the NBA season (which would have started November 1st) have already been cancelled, and the following two weeks are also in danger of being cancelled if something is not figured out soon. Even though nothing about this lockout looks different from the surface, I see reasons to be hopeful. When discussing how progress was made, Fisher said there was “obvious enough [progress] for us to come back.” It’s hard for me to ignore the fact that after meeting an entire 15 hours, they are going to meet again in less than 12 hours. There have been multiple times when the two sides won’t meet for many days because they get so frustrated with each other or feel as though they are just running in circles. To go as long as they did yesterday and to be insistent on meeting again today shows there has to be hope. Many might point out that just one week ago there was a 16-hour meeting that then turned into complete turmoil. The meeting the very next day ended with Derek Fisher calling deputy commissioner Adam Silver and Spurs owner Peter Holt “liars.” However, there is one vital difference between last week and this week – David Stern. He will be present at the meeting today. 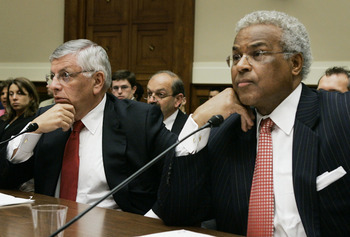 Last week, Stern was unable to attend the follow-up meeting because he had to go home with the flu. As I’ve stated before, Stern controls the owners. Without him, I don’t see any other outcome than the meeting falling to pieces. So this time, with him there, I expect progress to happen. The basketball related income (BRI) or revenue sharing has in fact not been figured out yet, which could lead to some doubting that progress has been made. Something David Stern said yesterday made me believe otherwise. “I think we’ll turn to the split when we finish with the system…right now, it has been profitable to turn to the system.” If Stern truly means what he is saying, he couldn’t have given us better news. This goes against what so many people have been harping on – the two sides’ inability to split up the revenues. By saying “we’ll turn to,” Stern gives the idea that it hasn’t even been a point of discussion of late, while they sort through other problems. If the two sides are about 2 percentage points apart and have not even been covering the topic recently, once the “system” is figured out, they will be so close to a deal, I can’t see them being unable to divvy up these last few percentage points. I realize I am unable to be 100% unbiased about this lockout; I love the sport of basketball and have always enjoyed watching NBA games. Yet, I just see too many signs pointing towards an unlocking of this lockout. I will even go so far as to say that by next weekend, I expect the National Basketball Association to be back in business.